Sandy and Laura are gearing up for QUILT SHOWS! Sandy has a booth this year! The Quilt Show will be held Friday and Saturday, June 15 and 16, 9 a.m. to 5 p.m., with vendors and demonstrations available those two days. 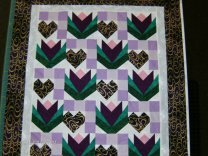 Sunday, June 17, provides only the quilts on display from 1 to 4 p.m.
Join us Thursday, June 21, 10 am to 4 pm to sew standard pillowcases for charity. This is not a class. You need to have had the pillowcase class or already know how to sew them. Please bring fabric to sew. Please let us know you are coming. Can't make it? You could donate some fabric! Each pillowcase takes 3/4 yard for the body, 1/8 yard for the insert, and 1/4 yard for the header. Learn the basics of thread, fabric, needles, cutting, stitching and more. You will make not one but TWO lap quilt tops. 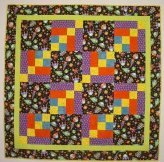 The 'Outerlimits' and the 'All squared up' quilts. Sandy will go over fabric on the first day of class. This is a six-part class with homework. On class days students can stay and sew after class. Learn to make a cute pillowcase on your 4 thread serger or sewing machine! Learn the basics of Applique and play with your machines stitches! There is a kit fee. The project is this cute birdhouse wallhanging by Margie Ullery. Please note that this is a picture from her book and not the colors in the kit. Learn to bind your own quilt! 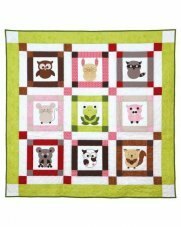 You will need a crib size quilt already quilted. A different way to piece! Explore paper piecing with Sandy. Time includes a 30 min lunch break.